I love getting new people into the tabletop gaming hobby. I make it a point to try to be a board gaming ambassador, to try to spread my love of games to the world. Today’s question deals with one aspect of advocating for our hobby, picking which games to introduce to new gamers. What game would you introduce to people who aren’t used to playing games? What’s the one game that you have introduced to hook people? Disclosure: Some links in this post are affiliate links. As an associate, I earn from qualifying purchases. There is no cost to you, we just get a small kickback if you buy something through one of these links. Using links like these helps keep this blog and our podcast going. I have a feeling everyone reading this blog over the last seven months is going to know this answer. 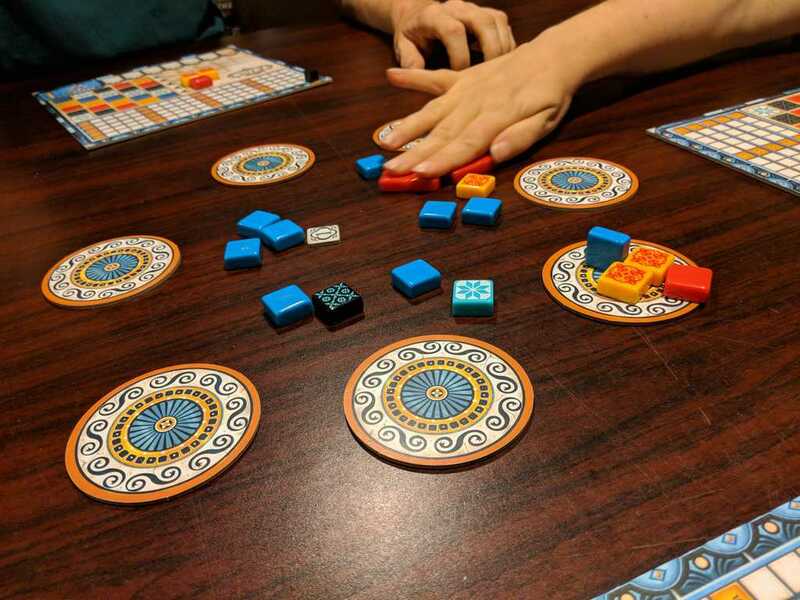 If I was limited to only picking one game to introduce new people to the hobby that game would be Azul . So far of all the games I’ve played and owned over the years, Azul has the most universal appeal. Everyone I have introduced this game to has loved it. This includes people new to games and old grognards who have been gaming for longer than I’ve been alive. I’ve yet to meet someone in person that didn’t enjoy this game. Yes I know there are people out there that don’t love Azul. I see them in my social media feeds. But even the people who don’t love it seem to admit it’s a solid game, just not for them. I’m sure there’s someone out there that hates it, but I’ve yet to see that person. Azul has a lot going for it. It’s eye catching and tactile. The pieces want to be touched, picked up and admired. The colours are bright and catch your attention. The player boards are well laid out and don’t look overly complicated. The rulebook isn’t thick or wordy and there are lots of pictures and examples. The actual rules are straightforward, easy to learn and possibly more importantly easy to teach. Game time is in that 30-45 minute sweet spot where it’s not quite a quick filler but short enough you often find yourself playing two or three games in a row. All of this combines with the fact that the actual gameplay is excellent. It seems simple at first but the more you play the more you realize the variety of strategies available. One game of Azul could almost be multi-player solitaire where as the next can be an in your face cutthroat battle for tiles. Azul is near the top of the pile of games with simple rules but deceptively deep strategy and tactics. I know I talk about Azul a lot, but for good reason. It’s one of the best games in my collection and one of the best choices for hooking a new gamer you will find. In her question Kat was looking for the one game I use to hook gamers. The thing is I don’t use just one game. Yes, Azul is amazing and it’s my go to introduction game but it’s not my only choice. I don’t actually think there’s one game that is great for everyone, just as there’s no game that every long term gamer loves. Taking a deeper look at the topic I think it’s worth looking at what makes a good game for introducing people to the hobby. What makes a good gateway game? I’m going to follow that up with some of my introductory game suggestions. This isn’t just going to be the usual list of gateway games you see everywhere, these will be games I have personally used to introduce people to our wonderful hobby. What Makes A Great Introductory Game? There are a few things to consider when picking a game to introduce a potential new gamer to the world of tabletop gaming. Some of these have to do with the games and others to do with the potential gamers themselves. Easy to learn: I put this first on the list for a reason. Unless you are sitting down with someone who has been curious about chit and counter wargames and has been wondering about Advanced Squad Leader since playing SSI games on their Amiga, you want to stick with easy to learn games. 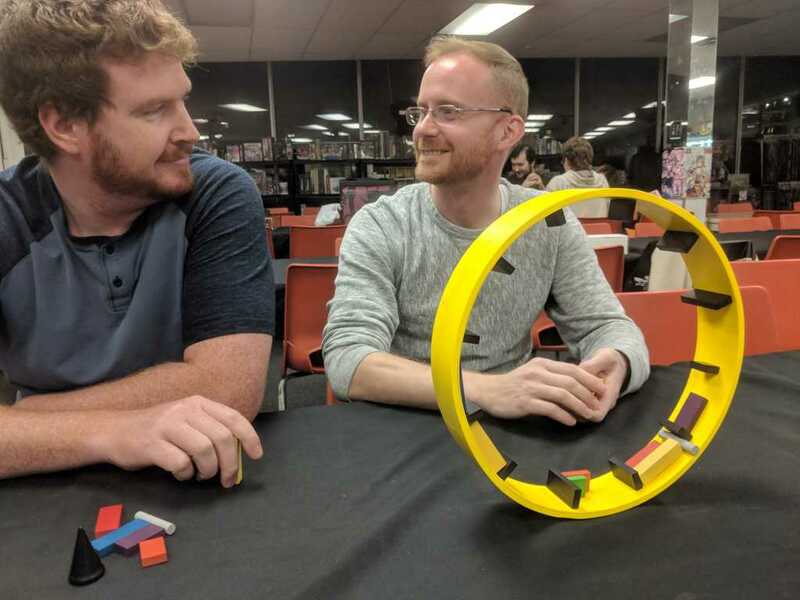 Games where the initial rules can be taught in minutes, not tens of minutes. Note I specifically said initial rules. You can go for a more complicated game but try to find one where you can get up and running and playing right away and then explain details once the game starts. You don’t want your new gamer to be bored before they have even flipped a card or moved a cube. A game you can teach: If you are trying to introduce someone to gaming make sure you know the game you are about to introduce them to. You don’t want to be referencing a rule book or teaching the Xtreme version of a game to a new player. Check out my Teaching New Gamers vs. 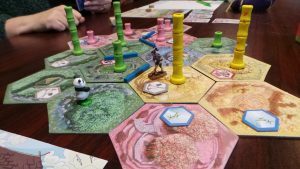 Experienced Gamers blog post for some more tips on teaching games to new players. Play something exciting: Here you are looking for something that is going to catch peoples attention and then hold onto it. You don’t want games with a lot of downtime. You want something that keeps all of the players engaged throughout the game. Try to avoid games with lots of decision points and analysis paralysis. There will be plenty of time for playing brain burners later once you’ve got your new gamer hooked and can slowly welcome them to the world of Feld. Theme can be everything: One of the first things I like to do when I meet a potential new gamer is find out what other stuff they are into. Do they prefer Sci-Fi or Fantasy. Are they a huge Star Wars fan? Is Harry Potter their jam? This has a big impact on what games I will choose to teach. If one of the first things I learn about someone is that they think they belong in House Hufflepuff, I’m going to be grabbing Harry Potter Hogwarts Battle over Azul for their first hobby game experience. This one is especially true for kids and younger gamers. Here is where I will often break the other suggestions. If someone already loves a particular theme, half your work is done in getting them to enjoy a game about that theme. I’m not a fan of fillers: I personally prefer to avoid short filler games. You want the game to have meant something. You want the players to feel they accomplished something. This often doesn’t happen with silly filler games. This is why I avoid many of the popular gateway games like Fluxx and party games like Apples to Apples . I find these games lack a feeling of achievement when done. They feel more like you just killed some time instead of spent it having fun playing a game. Team and cooperative games are great: Besides removing direct competition which can be a turn off to some people, especially someone experiencing hobby games for the first time, playing a team or cooperative game gives the new player support. They have someone on their side that can work with them and help them make decisions. These are also great for shy players as they are just part of a team and can take a bit of a back seat if not fully comfortable with the new game. Just be sure not to let other players overshadow or quarterback the new player. Helpful suggestions are good, telling someone how to play is bad. I love dexterity games: Dexterity games have a few things going for them. Most are extremely easy to learn and teach. They are very accessible and don’t require any special skills or knowledge. There’s no rules mastery issue where a player who knows the game well is going to dominate a new player. They tend to look awesome and be filled with tension and excitement. Dexterity games are really my go to introduction games. The thing is that they are not for everyone. Some people just do not like them, my wife being one of those people. 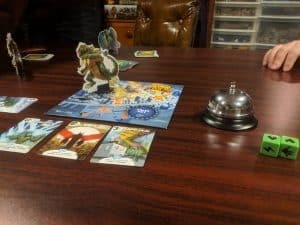 King of Tokyo – Technically the copy we have is actually my daughter’s, but this game is great for adults as well as kids. Anyone who has played Yahtzee will get the basic mechanics of rolling sets of five dice and getting a couple of re-rolls. It’s the theme and the look of the game that really draws people in. This is Kaiju King of the Hill where giant monsters are battling for control of Tokyo. It seems pretty simple at first but once people start buying power cards the game really starts to shine. If you are pretty sure your new gamer can handle a bit more rules toss in the Power Up expansion that makes the game more asymmetric and thematic. Black Fleet – This is a fantastic looking pick up and deliver age of sail game. The components in Black Fleet really draw people in. You have little plastic ships that actually have space to hold the goods cubes you are picking up and delivering. Then there’s some metal coins that have a great look and feel to them. Black Fleet is a card driven, take that, style game where players control both a merchant ship and a pirate. They try to deliver goods with their merchants while using their pirates to harass the other players. Red 7 – I often grab Red 7 if I find out that I’m with someone who digs standard card games like Euchre or Hearts. The rules in Red 7 are simple. Each turn play one or two cards, after you play those cards you must be winning. If you are not winning you lose. The thing is that one of the cards you play can change the rules for the game. You really need to see Red 7 in person in order to get it. It sounds way more complicated than it is. Start off with the basic rules and if people are digging it add in some of the variants and turn it into more of a brain burner. Takenoko – If you want to draw attention to your game table just set up Takenoko. The bright colourful tiles, the stacks of wooden bamboo and the ridiculously cute panda and gardener miniature, always draw a crowd. I’ve found players are often sold on the game before they have taken a single turn. Game play is also excellent. 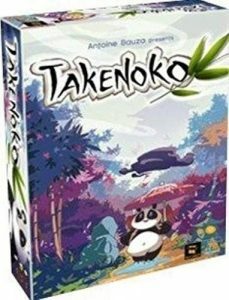 Takenoko is an action selection, set collection, game that’s fairly easy to teach. There are quite a few different actions you can take but each is very straight forward and easy to remember once you’ve done each of them once. This is another game I can play with my kids or have just as much fun with adults. Kingdomino – Take the basic concept of dominoes, placing tiles with two patterns on them by matching them to patterns already on the board, and tie in a fantasy kingdom building theme and you have Kingdomino. Each turn players draft tiles to add to their kingdom, trying to build large sections of identical terrain. This game is extremely simple to teach but make sure you play twice as the scoring sometimes confuses people until they have seen it work for the first time. Once you have the basics down add in the bonus scoring for having your castle in the middle of the board. Kingdomino has the added bonus of being excellent two players, great when it’s just you one on one with a prospective hobby gamer. Shadows Over Camelot – Seems I keep talking about this game. This is the game I grab if I’ve got a roleplayer who’s curious about boardgaming. It’s also a great cooperative game that’s fantastic for public events because people can drop in and out in the middle of the game. In Shadows Over Camelot each player takes on the role of a Knight of the Round Table as they work together to defend Camelot and complete Quests. But watch out, as one of the Knights may be a Traitor. I still think Shadows is the best example of the co-op with a hidden traitor genre. Flash Point: Fire Rescue – This is is my other big cooperative game choice when dealing with potential new gamers. In Flash Point you have a house, it’s on fire, and there are people and pets inside. 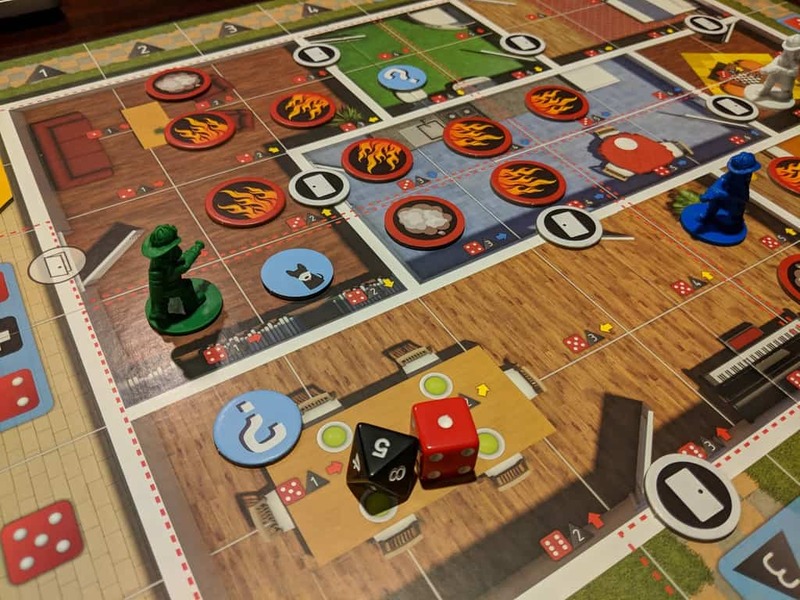 Players are Firefighters trying to save those people and pets before the fire gets out of control. It’s the theme of this one that really draws people in. The theme is also what puts this game above Pandemic for me. I find in Pandemic you are too zoomed out and it’s too abstracted. People don’t get emotionally attached to a dot on a map with some cubes on it. I find people do actually get emotionally invested when they are carrying granny out of a burning bedroom. A nice bonus in Flash Point is that it includes introductory rules, great for new players and/or kids and advanced rules for once players master the basics. Hamsterrolle – I mentioned it above, I love using dexterity games as an intro to our hobby. Of all the dexterity games I own Hamsterrolle is my favourite pick for a first game play. If you want to get people’s attention there isn’t much that’s going to catch the eye more than a big yellow hamster wheel with coloured blocks being stacked on it. This is the one game where I’ve frequently gotten people who claim “I don’t play games” to actually play. Not only play but love. The rules are simple and the amount of dexterity required isn’t that high. It’s more about picking the right piece to place and spot to place it, than the skill in actually placing that piece. Pitchcar – This is a game that I’ve set up and started playing and ended up getting non-gamers to play without even trying. At a couple different public play events my friends and I have set up a track and started flicking ,only to have a stranger come up, ask what we are doing and ask to join in. Pitchcar is a flicking based race game where you are flicking crokinole style wooden pucks along a wooden track. I really love this game but fair warning: it is not cheap at all. Concept – Yes this game seems to be on almost every game recommendation list I make. That’s because it’s a fantastic game. It’s by far my favourite party style game. The best part about Concept to me is that it doesn’t require any special skills or knowledge. You don’t have to be able to draw, be good with grammar or know lots of trivia. Concept works great with one player giving clues and the entire table guessing or in teams. Just toss out the scoring rules in the box and play for fun as an activity and not a contest.